The beauty and accessibility of Lake Louise makes it one of the busiest tourist destinations in the Rocky Mountains. Within a few minutes' walk of the Chateau, one can have breathtaking views of glaciers and some of the tallest mountains in the Canadian Rockies; all with that postcard perfect, iridescent lake in the foreground. Assuming of course, you can frame a photo without inadvertently getting a dozen or so tourists in the shot. It is said that for every hundred metres travelled away from a paved area in the Rockies, the size of the crowds can be expected to drop by half. Thankfully for Lake Louise, the area offers a wide variety of hiking and scrambling possibilities for those wishing to test this theory, while seeking a little more solitude and a unique perspective on the landscape. 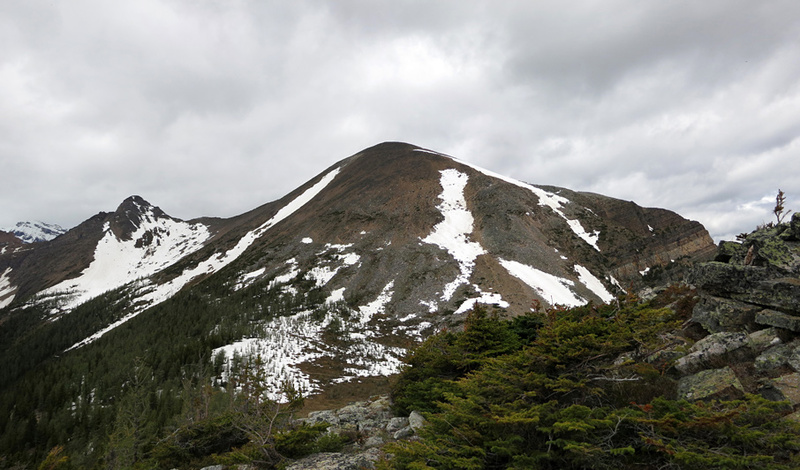 One of these possibilities is the easy hike up to Saddleback Pass which itself offers pleasing views of Mt. Temple, Sheol Mountain and Haddo Peak. For the more ambitious, this alpine pass offers access to the two easy scrambles described here: Mt. Fairview and Saddle Mountain. The Saddleback Pass trail begins from the top of the Lake Louise day use parking area, which you'll find to the left of the main resort compound when following Lake Louise Drive up from the village area. It's best to get a reasonably early start (by 10am-ish), simply to ensure yourself a reasonable parking spot. Granted, I was there during the Canada Day long weekend; but there were only 5 cars present when I started at 8:30am and then there were people being forced to park 2km down the road when I returned at around 2:30pm. The Saddleback Pass trail is well maintained and easy to follow. There are only two forks along its 3.4km route: the first is a choice between the Saddleback Trail (left) and a horse trail which leads towards Paradise Valley; while the second fork provides two choices for reaching the same destination. The path to the right is a steeper, but much more direct route, whereas the left is more gradual, and switchbacks to rejoin the main trail further up. After an hour of easy climbing you should reach the flat section between Saddle Mountain (climber's left) and Mt. Fairview (climber's right). Choosing to ascend Mt. Fairview first, I followed a path through a small collection of trees and out onto Fairview's open, rocky slopes. There is a well-defined trail all the way to the summit from that area, although you may have difficulty spotting it at first. 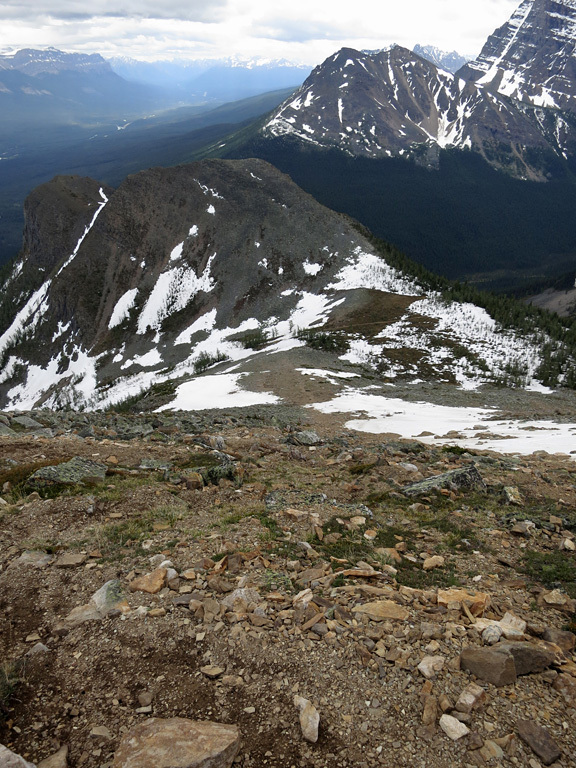 Looking at this photo, the trail is just to the right of the large vertical snowpatch in the centre. Because this route looked a little narrow, and limited in route choice compared to the broader area to the left of the snowpatch, I made the mistake of not following the trail (and saw several others repeating that mistake later during my descent). The terrain to the left of the snowpatch was a mix of boulder-hopping, incredibly loose scree, borderline sand in spots, and not incredibly fun. Although slightly loose, the trail to the right avoids the boulder-hopping and is reasonably compacted. Once you get onto the ridge, the steepness relaxes considerably and the rest of the ascent is pleasant walk along a good trail. 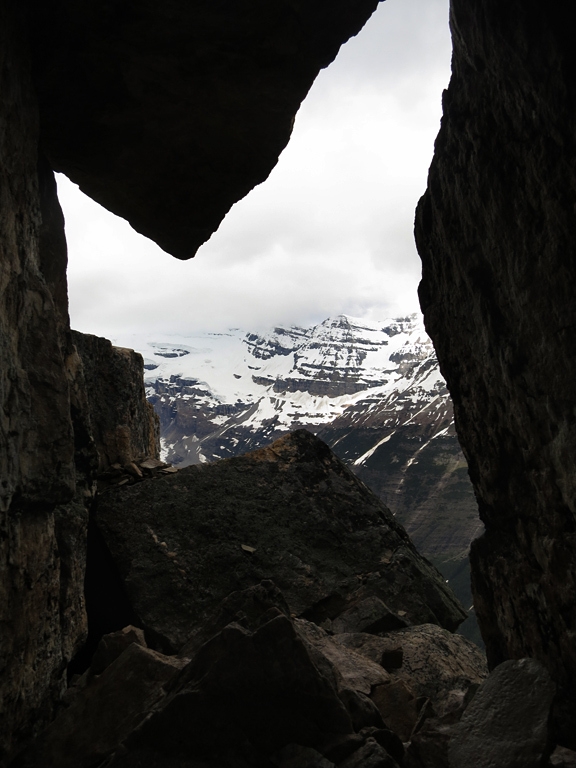 Once you're at the summit, it is possible to traverse in either direction in order to get different views of the Plain of Six Glaciers, the Lake Louise Resort, and other landmarks in the area. For the curious, there's a rock window just to the north of the summit that can be reached with some easy scrambling(a 1-1.5m downclimb). 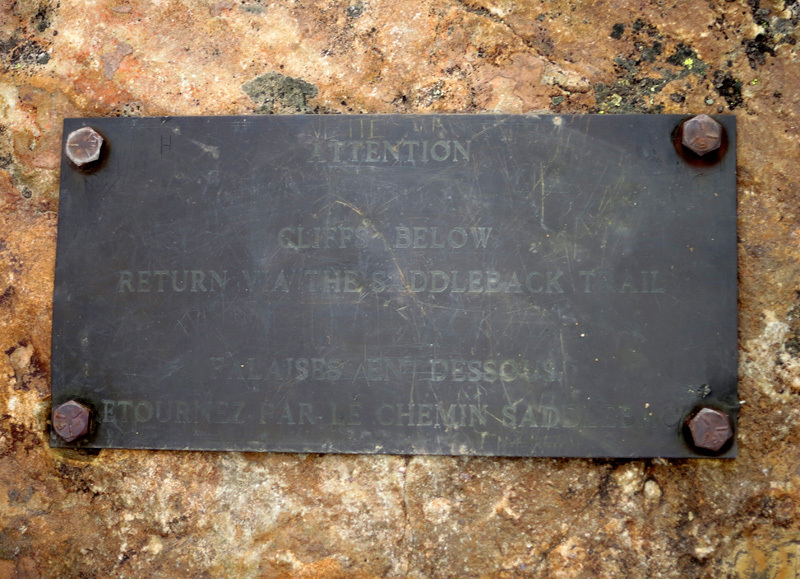 You'll probably notice a plaque warning against descending Mt. Fairview along its northwestern face. Although it looks tantalizingly possible to do so by following a descending ridge from just north of the peak to the southwestern end of Lake Louise (where one could then return via one of the trails around the lake), there are a series of impassable cliffs about two-thirds of the way down that can't be seen from the summit, and have resulted in rescues in the past. To avoid that kind of drama, simply follow the ascent trail back to Saddleback Pass. To climb Saddle Mountain (peak elevation 2,441m / 8,009 ft.) from the pass head for the ridgeline next to where the trees thicken and then follow the natural ridge up to the summit (you can see the route well in this photo). The route requires boulder-hopping for nearly the entire distance, but the rocks here are large and quite stable. However, they can also become quite slippery when wet. I was able to reach the summit within 30 minutes of leaving the pass. Exercise care when travelling along the summit ridge of Saddle Mountain as the drop to the southeast is breathtaking; a sheer drop in excess of 300m/984 ft. Once you've gotten over being wobbly-kneed by that view, return along the ascent route back to the pass and then follow the Saddleback Trail back to the Lake Louise parking lot. Admittedly, this is an odd warning to have to provide. However, be sure to keep a close eye on any gear you leave resting on the ground when around the peak area of Mt. Fairview. The squirrels up there are surprisingly aggressive, and will attempt to gnaw at, or burrow through, anything they can get at, including trekking poles. Having to defend my pack with a trekking pole, while applying sunscreen, was definitely a new experience for me. The ascent of Mt. Fairview is also described in Alan Kane's Scrambles in the Canadian Rockies. 2,748 m / 9,016 ft.
1,754 m / 5,755 ft.
994 m / 3,261 ft.
275 m / 902 ft.
2,441 m / 8,009 ft.
687 m / 2,254 ft.
241 m / 791 ft.